A big melodramatic romance. Lon Chaney! If you ever wondered how silent movies could dominate pop culture (as they did in the twenties), watch this! 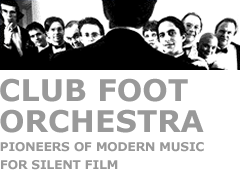 The score, commissioned by WNYC and "Silent Film, Live Music", was written by Richard Marriott and premiered January 22, 2005 at the World Financial Center, New York. The score calls for Soprano, Violin, Viola, Cello, Contrabass, Trumpet, Clarinet, Electric Guitar, Keyboard, and Percussion. Richard Marriott conducted the premiere. John Schaefer has featured the recording of the premiere repeatedly on his radio program "Soundcheck".